Have you ever received a call and when you hung up you cried? This happened to me recently. Oh rest assured, those tears were tears of JOY! I submitted a picture, was asked a question, got a call and cried. So, I sat and enjoyed every minute until I could tell someone that I was being asked and given the opportunity to be the food writer for Capital Style Magazine in Annapolis, MD. Hard work! 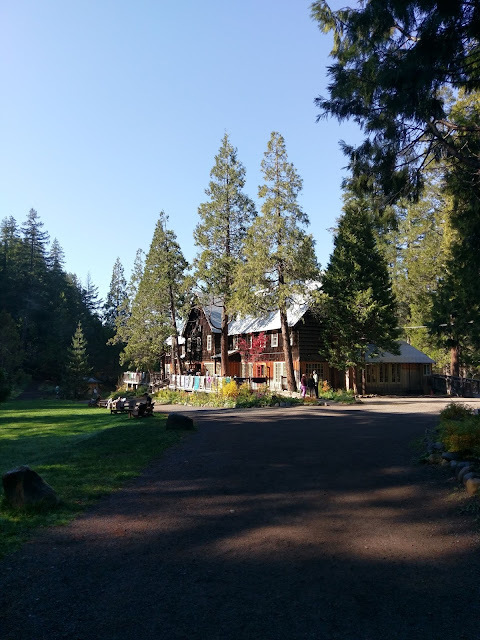 I started this blog in June of 2011 not having any one area of focus (writing or photography) of what I would do with it in a year. 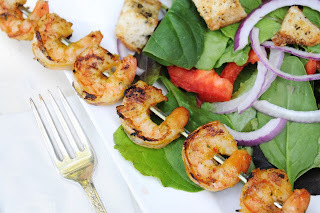 I worked really hard to maintain updates on the blog, worked on recipes, took pictures and just keep going. I wanted the process to be "organic" in the sense that I wanted the opportunity to find me and it did. Do you have a little voice that speaks to you? Well, I do. It kept telling me to "build it and they will come". Yes, I just used an old movie quote…but it is true. I knew that if I stayed focused and did my very best that something would come my way, and it has. 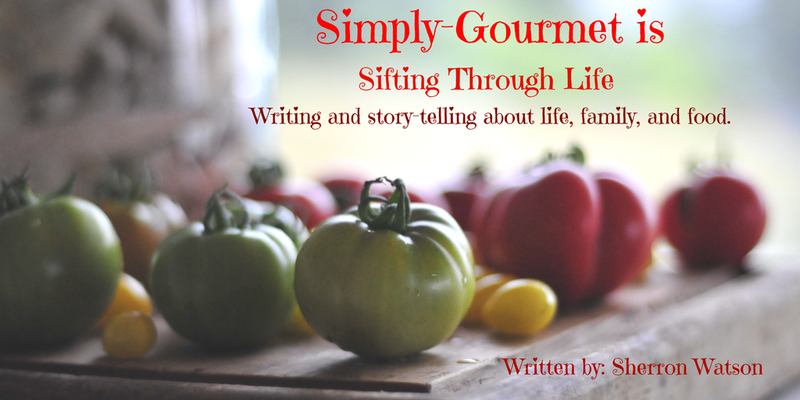 To write about food, create recipes and share this all while living in a place that I love…is a dream come true. This is my first set of recipes for Capital Style Magazine. I put together a set of recipes that could be a "mix and match" for one meal or they could be prepared individually and used at separate times. I chose to use Mango's because they were one of the first foods that I remember, as a child living in the Philippines with my parents, eating right off of the tree. I have remained a fan of this fruit my whole life. Mango's are best eaten when they are fully ripe. Even when they look over ripe their fruit inside will be so sweet and juicy. Here is a link showing you how to cut a mango. They even have a short video you can watch. 1. 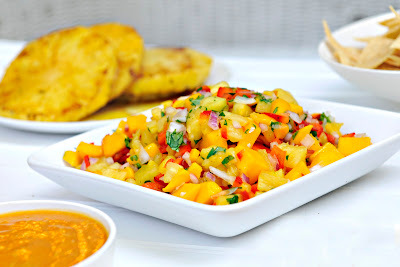 Mango Salsa: This is wonderful served with a batch of warm chips OR it could be used as a relish for your favorite grilled fish OR to add a tropical flavor to your favorite salad. 2. Parmesan Croutons: We eat these in soups (usually tomato bisque), like crackers by the handful or served with your favorite salad to add that extra crunch. 3. 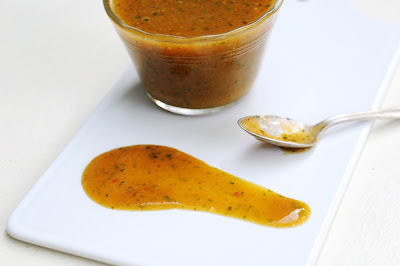 Mango Marinade/Dressing: Just as the title says, it can be used as a marinade for shrimp or chicken OR as a salad dressing. Our favorite way to enjoy the recipe is warming it first. In a medium size bowl, combine all ingredients. 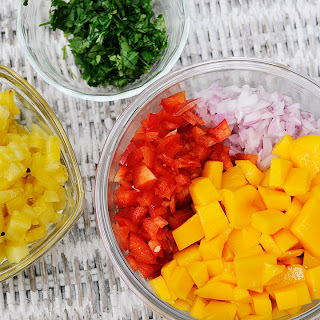 Mix well and serve with chips or as a side with fish. This will show you how each of the ingredients were prepared before I combined them. Makes 4-5 cups of croutons depending on how big your cubes are. 4-5 cups of cubed stale bread. French bread works great. Combine the bread cubes, olive oil, herbs and cheese. 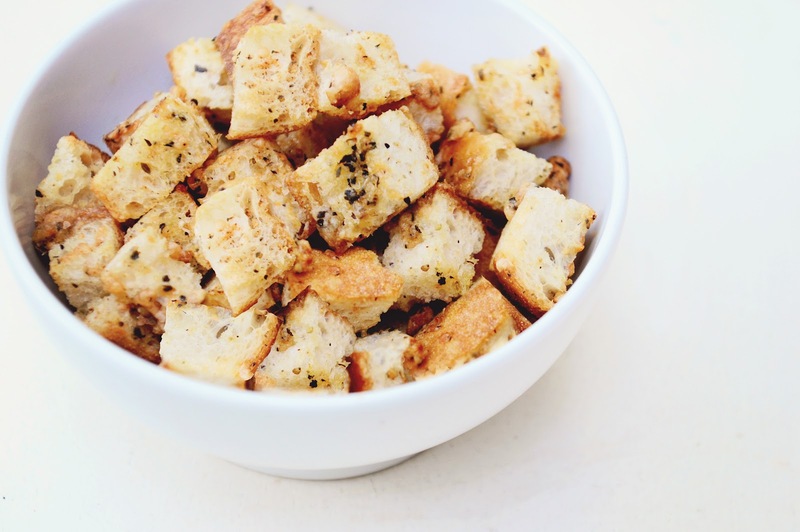 Mix well until each crouton is tossed with herbs, oil and cheese. Pour the entire bowl onto a cookie sheet. Bake for 10 minutes. Toss the croutons every 10 minutes until they turn a golden brown and are crunchy. The tossing will allow the melted cheese to stick to the croutons and bake into the bread cube. Estimated cook time is 45 minutes. Store croutons in a brown paper bag. They may be served with a salad, soup or just by themselves as a snack. 2/3 cup of sweet chili sauce. I used Mae Ploy. Using a blender, combine all ingredients. Blend the marinade/dressing until you have small flecks of herbs. To use as a marinade: In a bowl with your desired meat (pictured is shrimp), let marinate at least 4 hours in the refrigerator. If using raw meat, do not serve the marinade as a dressing. This should be thrown away. To use as a dressing: My family loved this dressing served warm over their shrimp salads. It will last one week in the refrigerator. 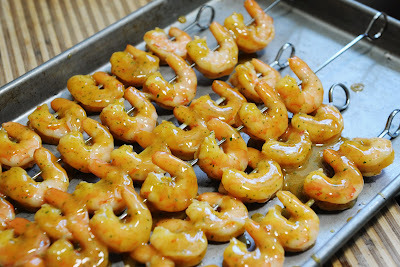 Here, I marinated the shrimp, skewered them, and grilled them on the BBQ for about 3 minutes on each side. I served the shrimp with a huge salad. 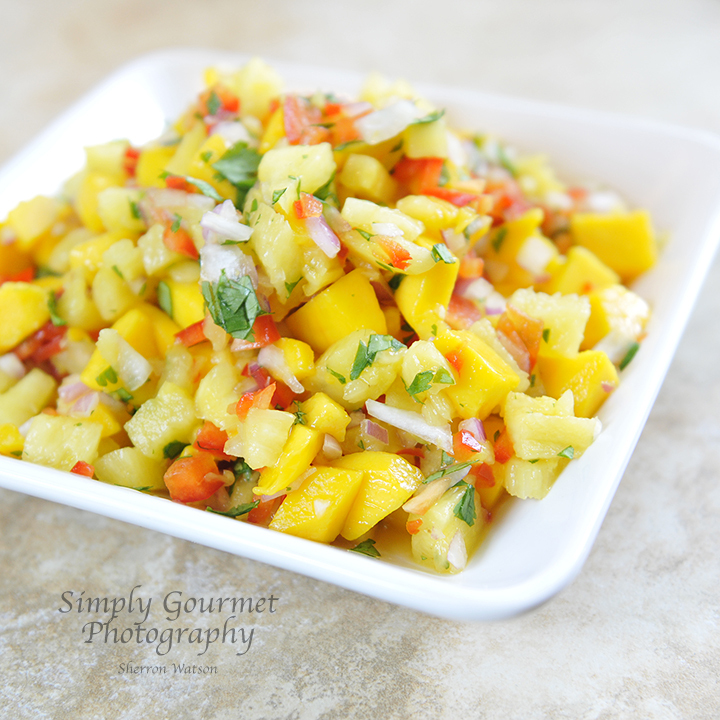 My family used the mango salsa, croutons and the warmed up dressing to combine all of the flavors to create a mouth watering dinner. So freakin' cool! Very very excited for you!! !